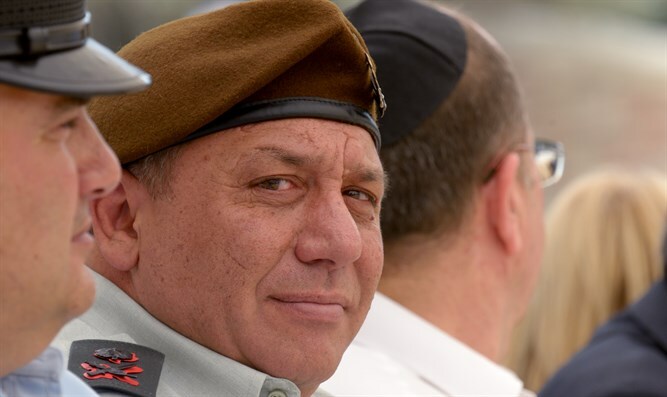 IDF Chief of Staff Gadi Eizenkot says IDF has offensive, defensive plans and is ready to fight on a moment's notice. IDF Chief of Staff Gadi Eizenkot participated on Wednesday in a conference titled, "For Their Sakes" honoring those who fell during the Six Day War. In his speech, Eizenkot spoke about the current situation on Israel's northern border, and the dangers it presents to Israel. According to Eizenkot, during the Second Lebanon war Hezbollah took a hard hit when 1,300-1,400 of its members were killed. "It was a very hard hit to the organization's infrastructure," Eizenkot said. "The war ended with the IDF 7-14 kilometers (4-8.5 miles) into Lebanon." "Eleven years later, Hezbollah has rearmed and is more able to fight, despite the complexities of doing so. On the other hand, the north has been quieter in the past 11 years than it ever was before: Children in Kiryat Shmonah and Nahariya are growing up without air raid sirens, without Katushya rockets exploding, without terrorists infiltrating into their towns, without any of the security issues which characterized the north for dozens of years. "We understand how important this is, and I can tell you that Israel sees our ability to fight the enemy as a top priority - both in general and in the north specifically. "The IDF is a strong, powerful army, and it has a definite advantage over its enemies." Regarding Hezbollah itself, Eizenkot said, "One-third of the organization's fighters are currently in Syria, Iraq, and Yemen, most of them in Syria. They've lost 1,700 of their men in the past three years, and they have nearly 7,000 wounded. They're in serious trouble, an organization trying to learn how to do battle in regimental formation." On the other hand, Hezbollah is gaining experience in war, which the IDF is "not ignoring." "In addition to their various budgetary problems and morale problems, we also have to understand that the organization lost two of its commanders over the last seven or eight years," Eizenkot said. "One of these was Imad Mughniyah, who was killed in Damascus. The other is a captain who was killed by his subordinates last year as far as we know, and as I said, we have very good intelligence." "Hezbollah is dealing with an incredibly complicated situation. They're fighting in Syria, but we're not letting them deceive us. We prefer to place our northern border and Hezbollah at the top of our priority list. "We have defensive plans, offensive plans, and a high level of preparedness to fight."